The StrokeBack concept puts the patient into the centre of the rehabilitation process. It aims at exploiting the fact the patients feel better at home, that it has been shown that patients train more if the training is combined with attractive training environments. Figure 1 illustrates how we think the vision of such a patient centric approach can come true. First the patients will learn physical rehabilitation exercises from a therapist at the care centre or in a therapists’ practice (left part of Figure 1). Then the patients will do the exercises at home (middle part of Figure 1) and the StrokeBack system will monitor their execution and provide real time feedback on whether the execution was correct or not. In addition, it records the training results and vital parameters of the patient. These data will be analysed by medical experts (lower right part of Figure 1) for assessment of the patient recovery. Also the patient will get midterm feedback on her/his personal recovery process. In order to ensure proper guidance of the patient also the therapist will get information from the PHR to assess the recovery process and decide whether other training sequences should be used, which are then introduced to the patient in the practice again. 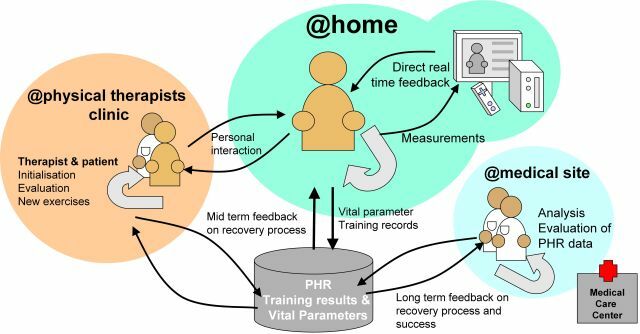 Figure 1: The StrokeBack rehabilitation cycle follows a patient-centric approach. The patient exercises at home while being monitored by the StrokeBack system. The exercise schedule and the exercise results are supervised by ambulant physical therapist care. All data are stored in the PHR to gather long term feedback on the rehabilitation progress.